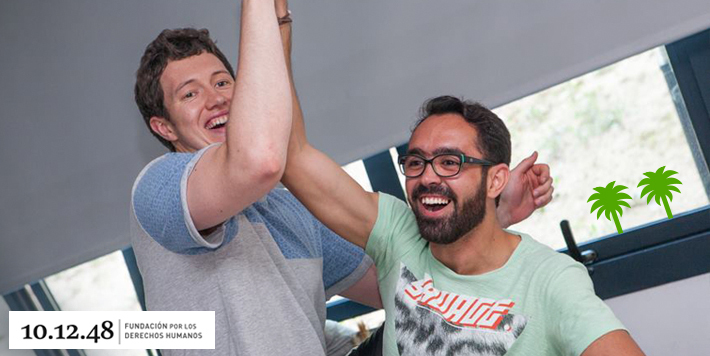 On June 24th, a group of young people between 18 and 25 years of age from England and Spain took part in a workshop about democracy and participation based on the game SmileUrbo. The activity was a part of the conference for the Youth and Human Rights project run by Foundation 10.12.48 with the support of the EU program Erasmus+. For one week the young people gathered in Valencia to attend lectures and workshops in film, music and photography. The main objective of this initiative was, on one hand, to encourage young people to be actively involved in promoting awareness and respect for human rights; and on the other hand, to develop solidarity, tolerance, and mutual understanding by way of youth exchange and by strengthening the capacity of civil organizations in the youth field and European cooperation. Additionally, it aimed to create a network of young Europeans for human rights that will aim to share this topic among citizens. The workshop lasted three hours, including a first round of SmileUrbo and a further debate where the group reflected on various diverse topics, such as democracy as a system of political participation, negotiation and teamwork as tools for citizen advocacy, or the conflict between a competitive versus collaborative approach to citizens’ interests. Foundation 10.12.48 is a private non-profit organization that works to promote, protect, and defend human rights. Through various art forms, they seek to promote reflection against injustice in order to change attitudes and encourage social participation in finding solutions to these situations.